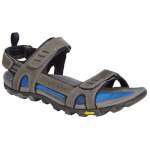 The Voyage Sport Sandals, From Karrimor. Designed to be durable, lightweight, comfortable and suitable for hiking in all weathers due to the Wolverine Waterproof, stain resistant pigskin. Let your sandals take you on a journey… with a Vibram sole there is no stopping you! Made from durable compounds the Vibram sole has made a name for itself over the years, being renowned for their performance and superb grip. Topped with a dual-density comfort moulded Phylon foot bed for comfort and of course the three point Velco adjustment system straps for great support and a personalised fit. 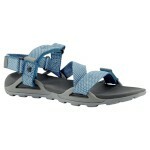 The Voyage Sandals are extremely stylish while being breathable, comfortable and hard wearing. Perfect for wearing at home on a regular basis or taking on holiday as they are great for walks through the forest or a stroll along the beach… wherever the day takes you, you will be pleased to be wearing a pair of these.